Discounts begin at 8-10 oz Pouches. See below. 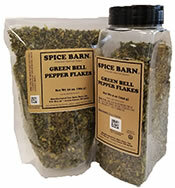 Description: Flavor, color, and aroma of green bell peppers. 1/4" dice. Usage: Use in any recipe. Great for pasta dishes, sauces, salads. Re-hydration: allow 3-5 minutes in boiling water, or 1-2 hours in cold water.